LA FIESTA is located at 50 - 74 SENGKANG SQUARE in district 19 (Hougang, Sengkang) of Singapore. LA FIESTA is a 99-year Leasehold Condo development consisting of 810 units. LA FIESTA is completed / TOP in 2017 (estimated), developed by EL DEVELOPMENT (SENGKANG) PTE LTD.
Educational institutions like LYCEE FRANCAIS DE SINGAPOUR, DPS INTERNATIONAL SCHOOL, HILLSIDE WORLD ACADEMY, SENG KANG PRIMARY SCHOOL, COMPASSVALE PRIMARY SCHOOL and NAN CHIAU PRIMARY SCHOOL are near to LA FIESTA. LA FIESTA is accessible via nearby SENGKANG, BUANGKOK and PUNGGOL MRT Stations. 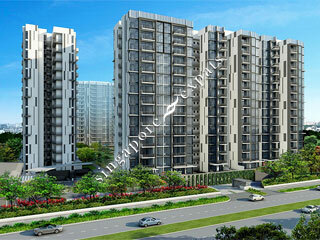 Brand New Condo near Sengkang MRT and Compass One Mall. Excellent full facilities condominium located right next to Sengkang MRT station. Just TOP, everything is new! Stone throw away from MRT. Countless schools including well known in SG within the radius of 1KM. 24X7 shopping center, food courts, Kopitiam, what more I ask for a house to live in – apart from the Condo facilities that comes by default.